LEPOWER Energy Saving LED Desk Lamp is a part of LEPOWER's continuing pursuit for creating highly efficient and convenient products for our customers. Beautiful and Classic shape design, it's not only a table lamp, but also a modern decoration for your bedroom and office. Soft and non-flickering design, the lighting is friendly to your eyes, helping you avoid eye fatigue caused by flickering light and harsh glare. Gently tap touch power switch to turn on/off the light and set the brightness level you like. Touch control with 3 Color Temperature to choose from: White, Warm White and Natural White. Perfect for working ,reading and sleeping. Advanced LED Lighting Source, using energy efficient technology, high brightness but low power consumption, save up to 75% of energy. ensure a long lifespan. 12 months warranty, 2 months money back. We are fully guaranteed for its quality problem. If you have any question or requirement, please feel free to contact us ! 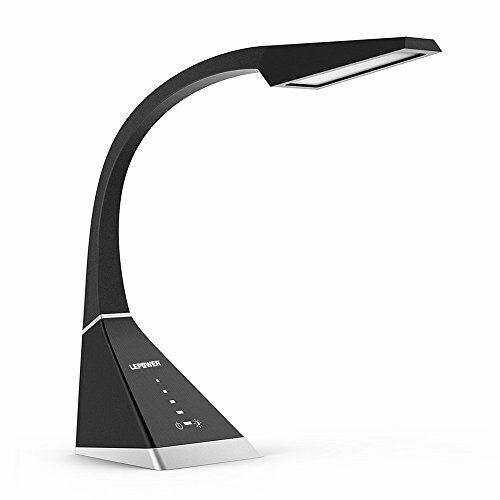 EYE-PROTECTION: Portable eye protection LED desk light with the latest lighting technology, produces soft and flicker-free lighting, relieve visual fatigue, effectively protects your eyes when reading, working and studying. ENERGY-SAVING: Environmentally friendly LED energy efficient technology, achieve the same level of illumination while saving up to 75% of energy compared to the traditional incandescent light bulbs. ADJUSTABLE GOOSENECK : Unique curved, Classic Design, simple and lightweight. With a flexible goose neck lamp arm, which makes it easy to carry. Perfect desk lights for office and bedroom. PROMISE FROM LEPOWER: 60 days money back. 12 months warranty, we are fully guaranteed for its quality problem . please feel free to buy! Simple Designs Home LT3052-GRY Shades of Gray Ceramic Stone Table Lamp, 8.19" x 8.19" x 14.04"